Welcome to another edition of FFF! A very chilly one here where I am if I may say so. It's time to look back over our week and look for and remember those things that have been a blessing, that uplifted us, that caused us to be grateful and thankful. Those simple, and maybe sometimes not so simple, things that brought some element of joy into our very busy and more than likely, stressful lives. If you need details, they are here. Then just join on in. 1. 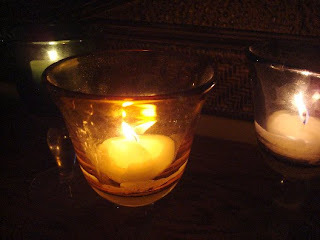 A candle's warm glow. Seeing it is cold and rainy here, I've started pulling out the warm scented fall candles. Sitting in the semi- dark livingroom with the warmth of a lit candle is just such a relaxing feeling for me. And the spicy scents of fall candles such as the "Pumpkin Bread" one I now have burning is so nice. Fall is actually my favorite season for colors and scents. me. But we did a round of burgers and they tasted extra good, I think, just for the reason of not having them so often. Mind you, it could have been the juicy, sweet tomatoes off my very own tomato bush that made so mouthwateringly delicious. What ever the reason, they were darn good. 3. Posts like this one that build up and encourage and point me back to the Lord. Words that are timely and fitly spoken are a real blessing in my walk with the Lord. Thanks Faith. 4. My duvet and duvet covers. Because of the cooler weather, I took off the summer coverlet and put on my big duvet. Can you hear me saying "Ahhhh!" And it makes it so easy to make the bed! But boy, between the comfort of that and it being dark now when I get up, it is getting hard, hard, hard to get my tush out bed in the mornings. 5. Corn on the Cob grown fresh locally, with real butter flowing down the kernels, a good sprinkle of salt and a nice cold glass of milk. Yummy. Have I got your mouth watering yet? What have your favorites been this week? If you do a post, please link to your specific post and not your home page, on Mr. Linky. That will make it easier for people to come and visit. Have a great weekend everyone and thanks for joining us at FFF. I prefer a barbecue and warm weather with a lot of sunshine to candles and pumpkins and colorored leaves ! in fact I hate autumn ! In Belgium too it was a lousy summer ! I love my duvet in the winter, too. All the food on your list sounds wonderful. We were at the beach this week with our two year old. Seeing all water, sand, and shell through his eyes was my favorite thing. Atumn is really kicking in now isn't it? It's hard to say goodbye to Summer, but warm bed covers, candles, and Autumn scents can be very comforting. I would have loved to try the corn on the cob and your cheesburgers, it sounds delicious. We haven't used the BBQ much either, like Gattina says, our Summer has been pretty lousy here in Belgium. I hope you'll have a wonderful weekend! Candles & fresh corn on the cob: 2 of my favorites! That corn on the cob looks lovely. Faith's post is wonderful -- thanks for recommending it! Fresh corn, grilled burgers, fresh tomatoes ... yum. As soon as you said corn on the cob, I didn't have to see the visual aid to feel hungry :) Candles burning awww... I love the sound and feel. YUM!!! the BBQ and corn on the cob are THE BEST! Nice list of FFF's this week. It is still so hot in east Texas. Today will be in the mid 90's and I don't see any signs of fall yet. We had fresh corn this week too and it seemed to be extra sweet, so good. I love candles too, they make a house so cozy. Love grilled hamburgers and corn on the cob! Sounds like things re getting cozy up there! I love the fall scents too!! Oh and the colors are awesome! :) It is my favorite season! I haven't dug out the candles yet, but I'm ready to do so! Fall colors and scents are a definite favorite of mine as well. You know...I don't think we had enough burgers this summer. I love duvets and candles and corn on the cob. 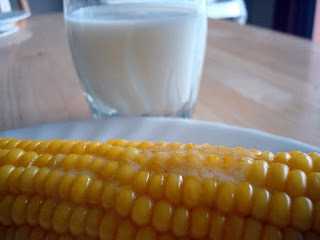 Enjoyed some good ole fresh Canadian corn a couple weeks ago...yummy! Have a great weekend Susanne. I keep asking where did summer go? I looove corn on the cob but no one else in my family does. This is a great travesty in my life. ;) But I love it when I can get it! Yours just looks so yummy! Corn on the cob, home grown tomatoes! You really got my attention with those! If I can have my sunny afternoons, I don't mind the grey mornings. But cold? Brrrr.. The warmth of the candlelight sounds lovely. Yes, you definitely have my mouth watering now. Hamburgers, corn on the cob, ... (I'll skip the tomatoes). And I can almost smell the candles. Fall is definitely in the air. I'm ready for the change of seasons on many levels. I could make a meal of that delicious corn on the cob. Yummy! I am enjoying a bit of fall through your favs Susanne. It is still very much summer here in Texas, but I did sense a teeny change in the wind yesterday. I wait longingly for that first cool front to make its way to us. I love to put fresh corn on the grill. Slather in butter, wrap tightly in foil and grill. YUM. Just make sure it isn't too hot or the bottom will burn once the butter melts. Send some of that rain and chilly weather this way. It's still in the mid 90's as the high during the day. I am soo glad my post titled "Higher" blessed you! glory to God!! ANd thanks for the shout-out! I also posted corn on the cob as one of my faves!! :) I'm tellin' ya susanne....we think alike! Oh, boy does that corn look good. I almost never get to eat corn on the cob these days since my hubby has diabetes and it isn't good for him. But I sure like it. And duvets are heavenly for sure. I'm so late in the day getting to read. Susanne your candle is so warm and inviting I am glad you mentioned it, I'll take out a bit of warmth over the weekend. A duvet has a way of making you feel AHHH! Oh.my.gosh. That corn looks SO good! That corn looks soooo good!